There’s been a huge rise in the popularity of growing plants using indoor smart gardens over the last few years. 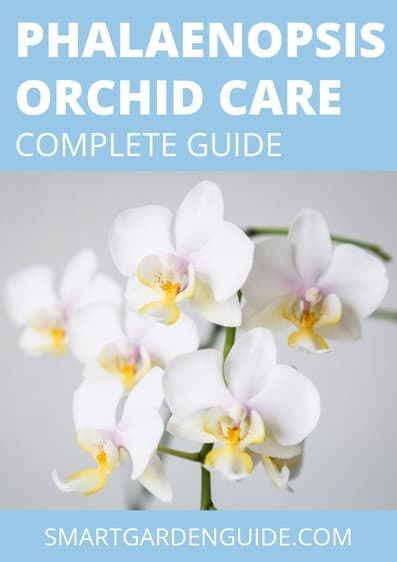 It’s a great way to bring plants inside, and allows everyone to enjoy the pleasure of growing plants, without necessarily having a green thumb. Some of the designs and features are incredible and they don’t always have to cost a lot of money. This article looks at some of the best and most innovative options available. 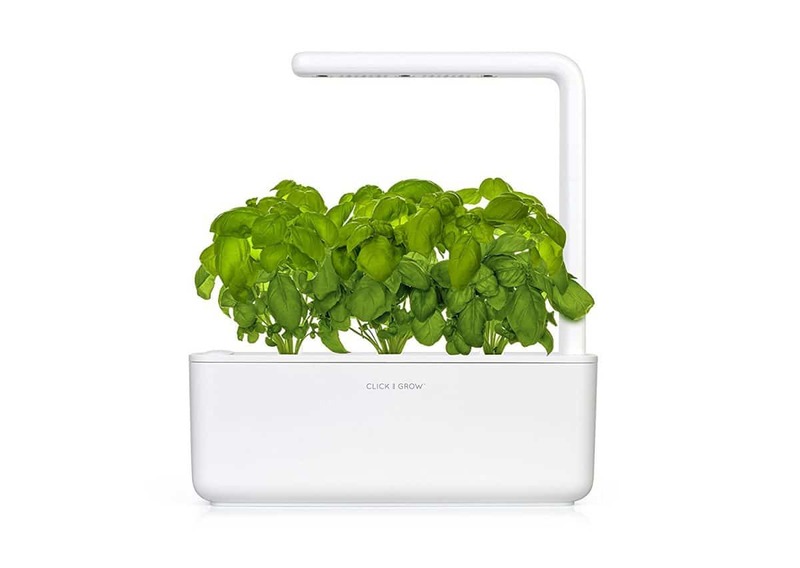 The Click And Grow Indoor Smart Garden is a great product for growing a variety of herbs, greens, fruit and vegetables in your kitchen. It takes a lot of the hard work out of looking after indoor plants. All you have to do is add water and a small amount of nutrient solution to the reservoir every so often, and the plants will look after themselves. It has an integrated LED grow light to ensure that your plants can grow anywhere in your house. I think the Click and Grow Indoor Smart Garden looks great and is a product that is useful in the kitchen. However, the refill packs are quite expensive, which takes some of the appeal off this product for me. I love the look more than the actual practicality. Still, it looks cheerful and would brighten up most kitchens. 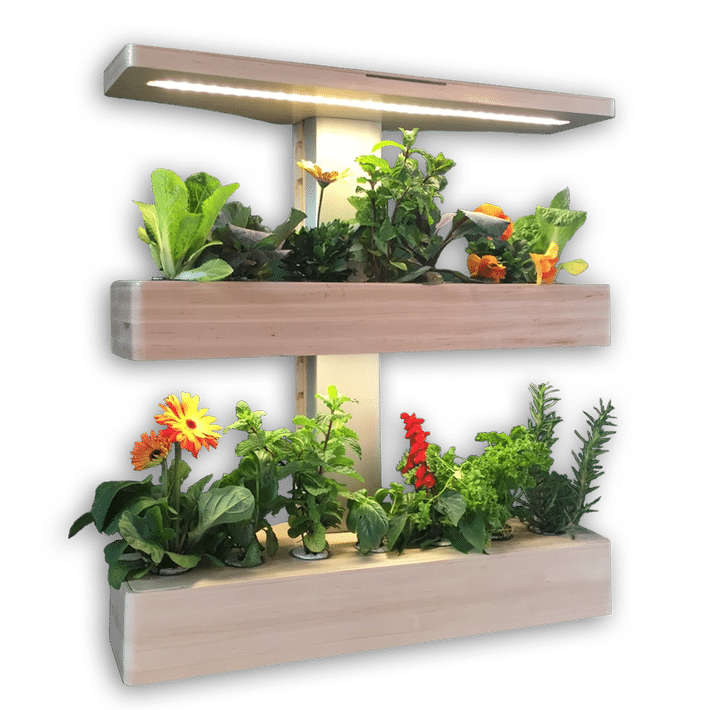 The LeGrow smart garden is a modular indoor planter system where you can customize the layout of your smart garden by connecting the individual planter pots together. You can stack and arrange the planters and add to your smart garden over time. 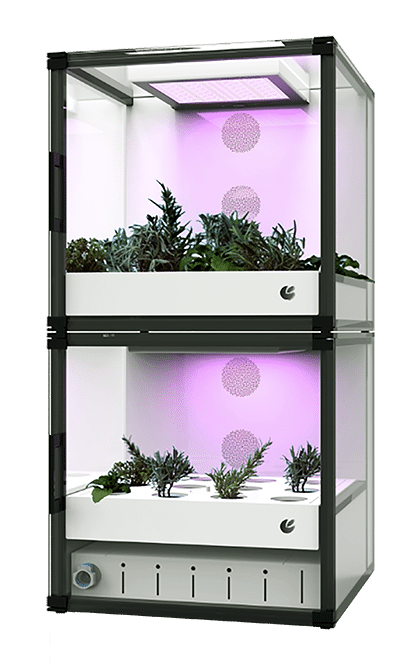 There are multiple options for the system, including grow lights and humidifiers, and even planters with integrated clocks and mobile device chargers. Best of all, this is actually a fairly inexpensive option. As it is modular, you can try it out and expand over time if you like and enjoy it. There’s no automated watering for these planters, so caring for the plants may take a little more effort, but the base trays of the pots will hold a small amount of water, which should make them slightly more forgiving for the more forgetful gardener. While only suitable for small plants, I absolutely love the LeGrow planters. I have them lined up on a shelf in my kitchen where they look fantastic and get plenty of comments from visitors. You can buy the LeGrow Smart Garden from Amazon and the LeGrow website. 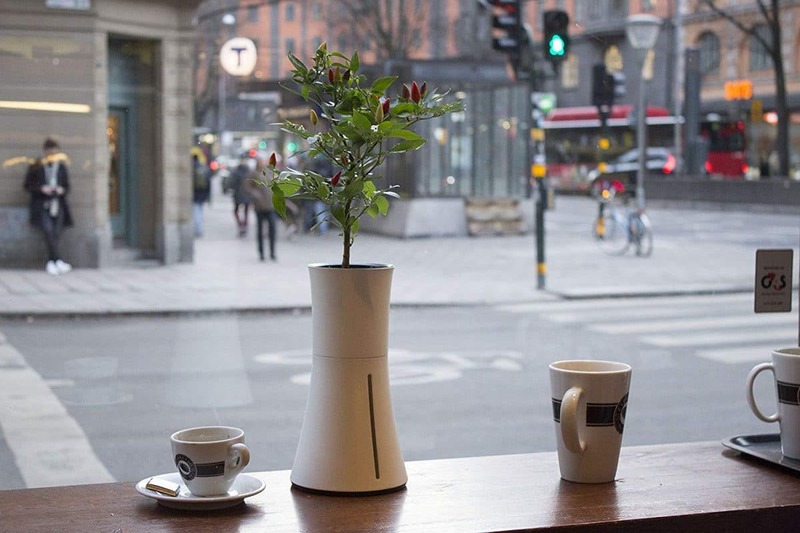 Botanium is a smart plant pot which makes looking after indoor plants very easy. The bottom of the Botanium houses a water reservoir which is topped up with water and a small amount of supplied nutrient solution every few weeks. The plants that you grow in the Botanium are supported by porous stones, rather than soil. The system has an automated water pump which delivers water and nutrients to your plants every 3 hours. The excess nutrient solution drains back into the reservoir and is reused, making this a very efficient system. It’s best to put the Botanium on a south facing window ledge, or alternatively, you can use a separate grow light to allow you to place it in darker locations and grow plants all year round. The Botanium requires a power supply and there is no option to power it with batteries, which may well deter some people. In my case, I wouldn’t want the power cable to be visible, and I can’t think of an obvious location in my house where I could put this and hide the power cable easily. The Veritable smart indoor garden is a Kickstarter success story. It’s a smart planter that was designed by the team at Veritable in 2014 and was successfully funded on Kickstarter in November 2016. They’ve since gone on to fully commercialize their product, which is now available to buy at their website www.veritable-potager.fr and from a number of international online retailers. 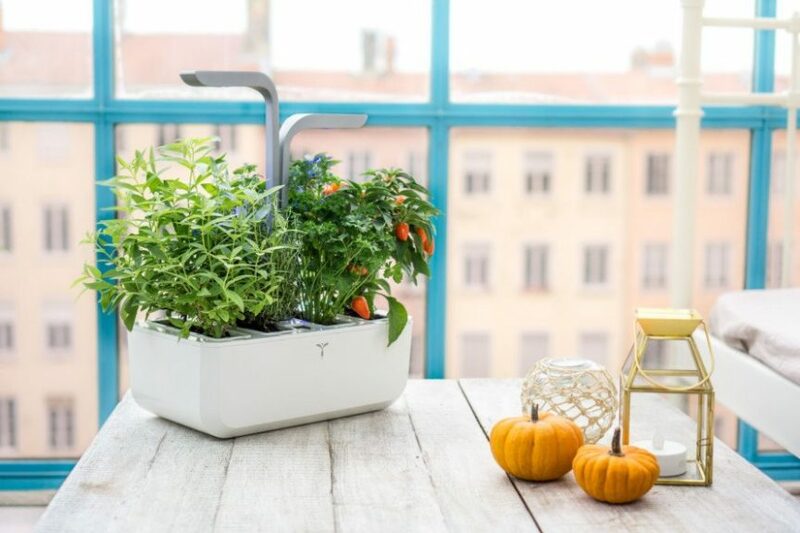 The Veritable smart indoor garden works in a similar way to the Click and Grow, but I think the design of the Veritable blows the Click and Grow out of the water. It comes in a number of different styles and I think this would add a bit of class to most kitchens. The Veritable contains a reservoir tank, which holds the water and nutrients, and automatically delivers these to the plants to keep them in great condition. The reservoir only needs refilled every few weeks, which is great for those of us that struggle to remember to water our houseplants. There are two separate LED grow lights, which have been specially designed to provide the optimal light wavelengths and intensity for the types of plants that will be grown in the Veritable. As for seed refills, the Veritable uses custom designed “Lingots”, which slot into the Veritable planter. They contain organic seeds, biological substrate and essential nutrients for each plant. All you have to do is drop them into the unit, and the Veritable takes care of the rest. Overall, a highly impressive product. The price isn’t cheap, but will appeal to those looking to combine great design with a practical product. 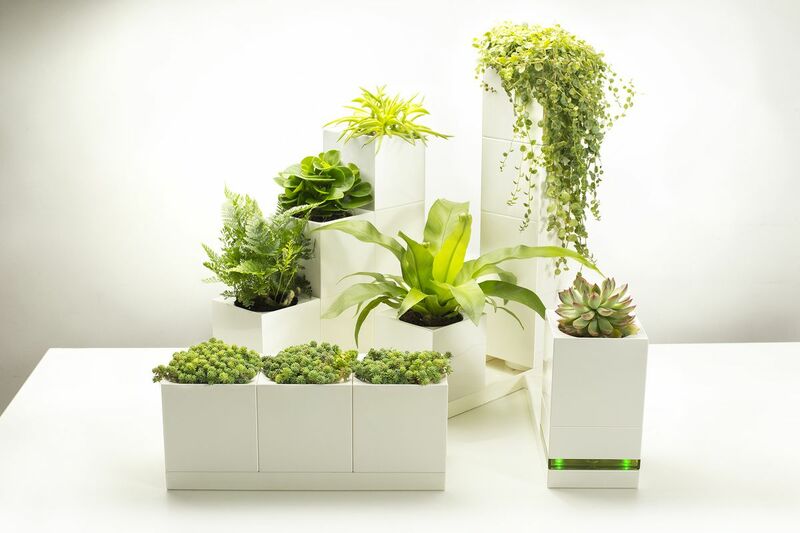 The EDN WallGarden is a larger indoor smart garden that you hang from a wall in your house. It automates watering and fertilizing your plants, as well as providing lighting, through built in LED grow lights. Whilst not yet available, for sale, you can check out EDN’s website for further information and to check availability. This product looks like it would be capable of providing a decent amount of produce, so could be a very nice source of fresh herbs and greens. The EDN WallGarden comes with built in WiFi and has a smartphone app that you can use to monitor your plants and get updates when you need to add more water or nutrients. The Plantui 6 smart garden is another automated growing device for small plants such as herbs, chilies and tomatoes. It has a sleek, modern design and integrated grow lights. A great option for anyone who wants to grow greens, but lacks outside space. 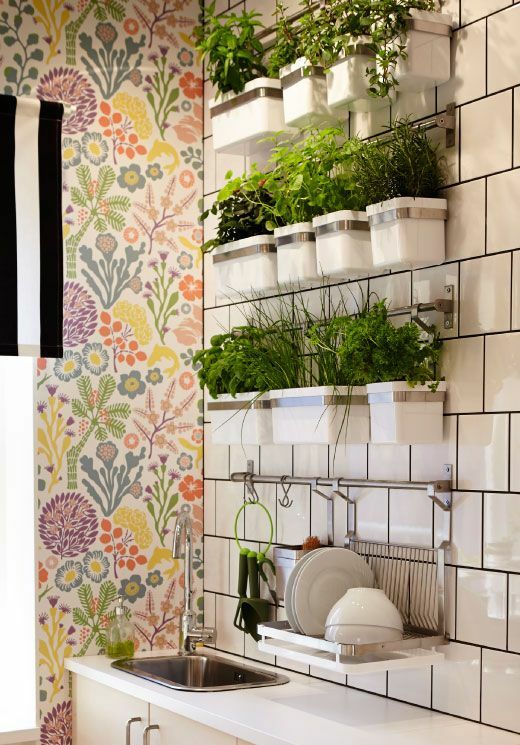 It’s also a good option for those people who struggle to look after herbs in their kitchen. The Plantui 6 automates pretty much everything, so its hard to go wrong. The Plantui 6 is pitched at a fairly premium price and plant refills are quite expensive too. However, I could imagine it being pretty fun to grow plants with the Plantui and it’s great to have fresh herbs available at all times. Find out more about the Plantui 6 and their other products at Plantui.com. 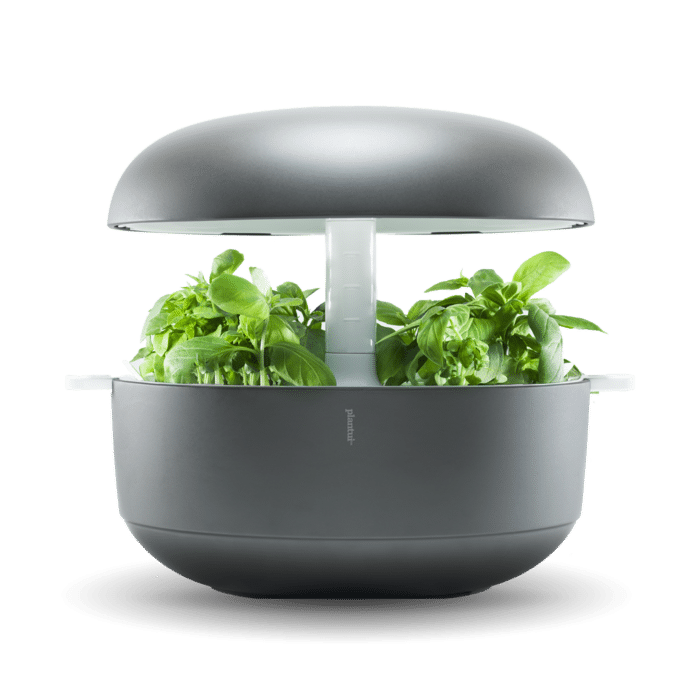 With a great design and excellent concept, the AeroGarden Bounty makes growing herbs and salad greens at home a simple endeavor. I love the LCD display which tells you when to add more water and nutrients, and controls the lighting timing also. You can grow 9 plants at a time, from herbs and lettuce, to chilies and strawberries. The height of the grow light is adjustable and has a decent power output of 45w, which ensures that your plants will get sufficient light even in darker areas of your house. The soil-free seed pods are easy to use and refills are available at a reasonable price. There is a large range of models, and they generally offer better value for money than some of the other smart herb garden kits. I would definitely recommend the Aerogarden Bounty or the Aerogarden Harvest Elite 360 (links to Amazon) depending on the size of the unit you want to go for. I’ve had great success with the Harvest Elite 360, but the Aerogarden Bounty allows you to grow more plants at once. 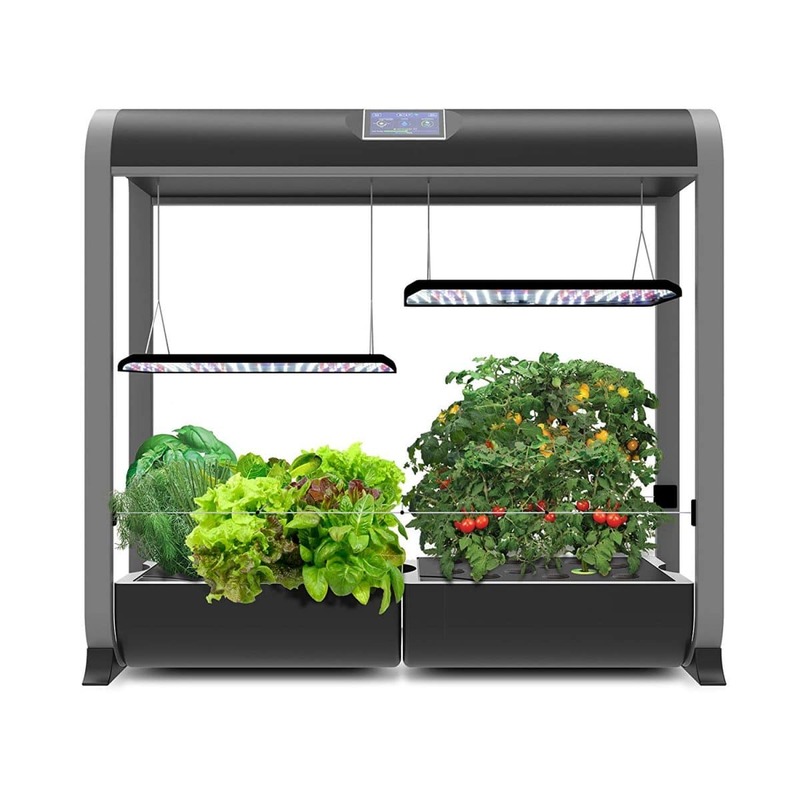 Following right on from the last indoor smart garden, the Aerogarden Farm Plus is a great option for people looking for a larger scale operation. I could really see one of these providing a significant crop of useful vegetables, herbs and salad greens. I think this indoor smart garden could look so impressive in a kitchen, provided you have the room for it. Alternatively, this could be placed anywhere in your house, providing a nice splash of greenery to an indoor space. 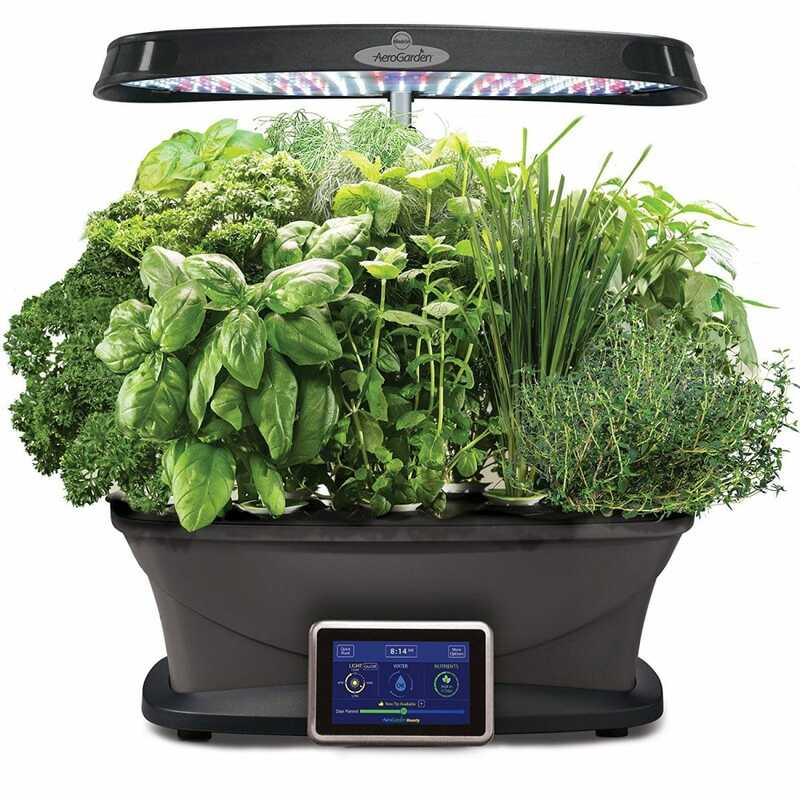 The Aerogarden Farm Plus comes with built-in WiFi and many of the features can be controlled with a smartphone or tablet. The Aerogarden Farm Plus comes with dual 60w LED grow lights and allows you to grow up to 24 plants at once. It also has a good selection of seed pods available, and you can even grow your own seeds if you like. The only drawback of the Aerogarden Farm Plus is that it costs a premium, but it gets great great reviews on Amazon and would be very practical way to grow a significant amount of food in a small space. Check out the Aerogarden Farm Plus and read the reviews (link to Amazon). This next indoor herb garden is a DIY project built with a few rails and pots from IKEA. I absolutely love the look of this project as it really brightens up this space. The rails are simply screwed to the walls and the pots are hung from the rails. The great thing is that the pots can be taken down to trim or water your herbs, or if you want to repot or change the plants. This means you can constantly customize the look of arrangement. There are no electronics or smart features with this setup. It’s just a creative take on a traditional indoor herb garden that looks great. Of course, you don’t just have to grow herbs in these pots, but the lack of supplemental grow lighting will limit your options a little. Still, a wall near a bright window will give you lots of options for what to grow. 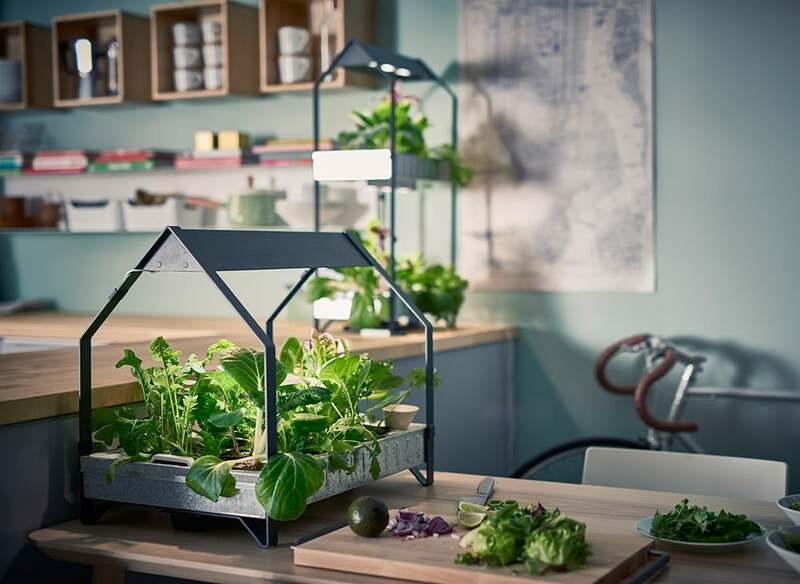 Another indoor smart garden option form IKEA, but this time a purpose built hydroponic system, and a great value one at that. This is a fairly simple system from IKEA, but it comes in a number of different sizes and with one or two tiers. It has built in LED grow lights and a nutrient reservoir under where the plants grow, so you only need to water the plants every week or so. IKEA sell these either individually or as a kit. They also supply fertilizer, seeds, growing media and spare grow lights. The pricing is really reasonable and it looks great, with classical IKEA styling. The Aquasprouts Garden is a fairly affordable option that combines an aquarium and a grow bed into the same system to create a small home aquaponics system. The water in the aquarium is periodically pumped up to the grow bed in a flood and drain system, allowing the bacteria and plants to deal with waste products produced by the fish in the aquarium. The plants use the waste as fertilizer which allows them to thrive. The Aquasprouts Garden comes with a light bar and optional LED grow light, allowing you the flexibility to use this indoor smart garden in any area of your house, with the aid of supplemental lighting. Whilst you won’t be growing a lot of food with the Aquasprouts Garden, it is a really interesting and compact way to get an introduction to aquaponics. The price point is pretty good, and customer reviews have been largely positive. 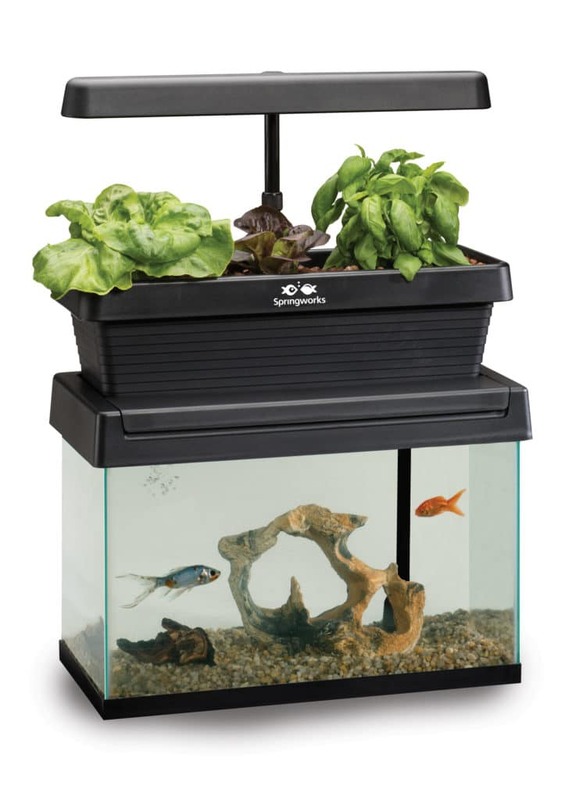 Check out the Aquasprouts Garden and the customer reviews. I absolutely love this idea for a low maintenance indoor smart garden. It uses a cultivation technique called aquaponics, where fish and plants provide mutual benefits when they are grown together. The waste that the fish produce would normally accumulate in the water of a fish tank, but in this system, the water is circulated up to where the plants are growing. Beneficial bacteria break the fish waste down into useful fertilizer which can be used by the plants to grow. The plants remove the waste from the water, and the clean water is then returned to the fish tank. 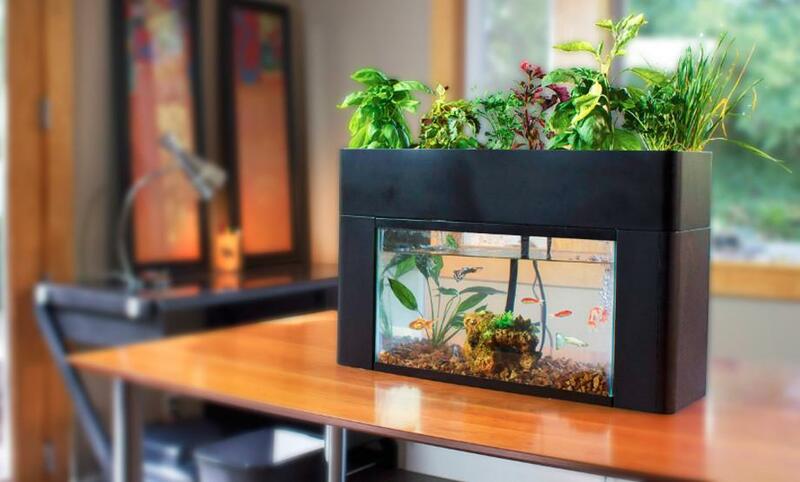 The fish stay happy and healthy and your plants grow at supercharged rates. The integrated grow light allows your plants to thrive all year round and in any location in your house. 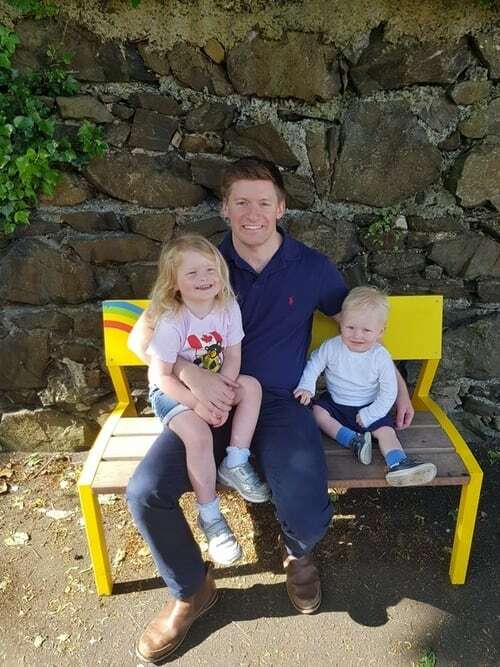 I think this is a great product for both children and adults. I always love to keep fresh herbs in my kitchen for cooking, but I’m not always the best at looking after them. With this system, the plants always get sufficient light, water and nutrients. This is a fairly sophisticated indoor growing system, that automates most aspects of growing plants indoors. It controls lighting, ventilation, air flow, temperature, water and nutrient delivery to your plants. It is another hydroponics system, which utilizes the benefits of growing plants without soil. It has a fairly industrial look, but I think it would look great in the right setting. It has integrated smart functions and a companion app that lets you monitor and adjust the settings within the growing environment. The CityCrop is available to pre-order from the CityCrop website. 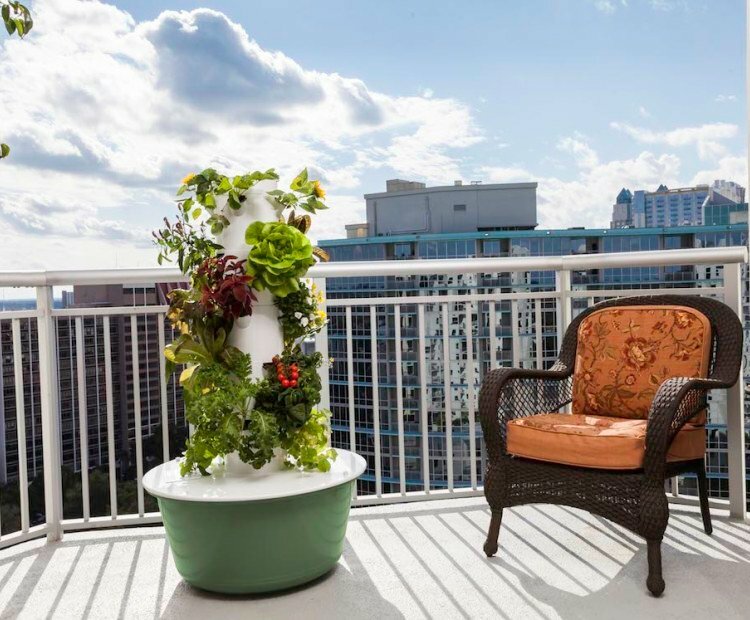 Maybe an option for a balcony or patio, rather than in the middle of your kitchen, but still a good choice for growing greens a herbs in a compact space. This is a hydroponic vertical garden that could really brighten up a small space. It doesn’t come with any supplemental lighting, so you’ll need to make sure there is a good natural light source, or provide your own grow lighting. The plants themselves are grown in a rockwool medium and the nutrients and water are delivered to the plants by a water pump and drip irrigation system, fed from the 15 gallon reservoir at the bottom of the tower. Customer reviews seem to be a bit mixed with this one, but I think it is more a case that it requires a little more experience with hydroponic growing than some of the other options on this list. How Long Do Cacti Live? How Much Water Do Cacti Need?